When your child enters a daycare or preschool program, one question you may have is: how effective will this program be? Does my child need to sit in a desk to learn, or find their own way through play? Is experiential education in early childhood a wildcard? Or should my child be gaining knowledge through measurable instruction? But there are also pedagogical theories that don’t take on the form of a branded franchise (though, none of the above terms are technically franchised). These extend beyond a particular preschool curriculum. They have to do with the values and qualities in early childhood education itself, regardless of any procedural or pre-programmed method. They are considered overall, learned philosophies, and studied as educational research. One of these theories is called experiential education. Experiential education is seen as important part of learning at any stage in life. 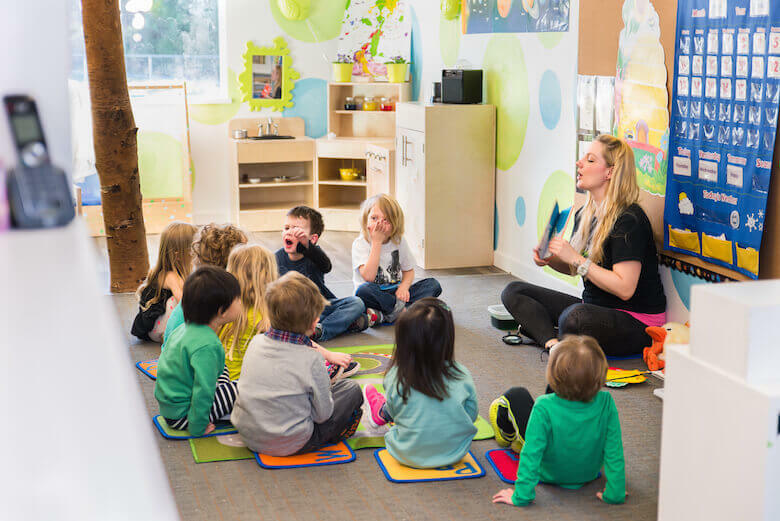 In this article we’ll delve into what this term means for early childhood learners, and why it’s important for any preschool program. What is experiential education in early childhood? While you may google to find the term “experiential education” in many contexts that are applicable to older kids – like those in high school – our focus will be on early childhood learners. Early childhood learners are a particular focus of experiential education, mainly because we can see through plain observation that their ‘style’ of learning is naturally not inclined to sit at a desk and listen for long periods of time. That takes maturity and practice to develop, and in some people, it’s always a difficulty. Children are natural-born ‘players.’ They learn through independent discovery. It doesn’t take much to prove this. One simply has to watch a toddler for about an hour to ‘get it.’ Will they eat their noodles and peas without playing with them? Not likely. First, they must be squished. And rolled. And get water poured on them. And slushed around. And thrown on the ground. This is all part of learning, of course. So when toddlers get to daycare or preschool, some believe it’s just not innate for them to suddenly sit down, keep quiet, listen, absorb, then go home and say they’ve learned something. Instead, experiential education theorists emphasize the need for these young learners to acquire their knowledge by ‘doing.’ It can be thought of as a kinesthetic approach, in terms of learning styles. But it’s more than that. They need to first plan out the activity and hope to learn something from it before doing it. Afterwards, they need a way to reflect or process in their mind what they have learned. The before and after require an educational facilitator, to help guide them. Journaling, charts, discussions – these can all work as the ‘before and after’ executions. Experiential education also assumes that students are creating their own learning to a degree. They aren’t being told how to playfully learn. And they’re not necessarily given a set of instructions for the ‘doing’ part of the experience, as much as they are forming those steps with the educator in advance. They are simply guided and encouraged. The outcome is not controlled – even mistakes can be part of learning. But the educator should ensure that the child is on the right path towards learning something. Why is experiential education important in early childhood and preschool programs? There many obvious benefits to experiential learning. And it’s not new or unheard of educational settings. However, it can be forgotten, at times. Adapting the theory seems to put a ‘check’ on whether or not an early childhood education program is effective, or fulfilling its intentions. Are the kids engaged? Do they enjoy coming to school? Are they happy to be involved with the rest of the class? If not, it’s time for a change. Educators, facilitators, teachers, curriculum developers and the like need to evaluate their real-life classrooms in this light, and adapt as necessary. This article explains the way experiential education can create the need for intervention, and ways to ensure that kids have the most potential for learning and growth. We strongly encourage reading it, as it is quite detailed! Others will say that experiential learning can also give young children “life skills.” This is because it is so practical, and requires attributes like conflict resolution, thinking on one’s own, taking action, assuming roles within a group and more. Experiential education also turns ‘textbook knowledge’ into applicable, real-life uses. This can be much more interesting for a student, and a way for them to enjoy what they’re learning once they see its purpose. They’re also more likely to hold on to those experiences and remember them well into the future. What are examples of experiential education in daycare and preschool? At Rainforest Learning Centres, we include experiential education in almost all aspects of our curriculum. One example would be our recycling programs and environmental clean ups. Our daycare and preschool kids aren’t just told to go clean up and sort garbage for the sake of doing chores. No! These activities have learning purpose. The children learn about how their actions affect their community. They get to see the results of their work through charts and goals. And so on. We also adopt a duck pond in one location. Where do the ducks come from? Who feeds the ducks? What happens if the duck pond gets dirty? How do the ducks fly? Why do we need ducks? So many lessons can be learned by our children going outside and actually doing something with the duck pond. But in the classroom, we discuss what we’ve learned. Obviously, a picture book, lecture or a video documentary would not accomplish the same goals here. All in all, we can see that experiential education is a great qualifying factor for any preschool or early childhood education program. This is not only because it ‘fits’ with the active nature of young children. It is also seen as an effective way to learn, a more enjoyable way to acquire knowledge, and a method to help those lessons ‘stick’ for longer.